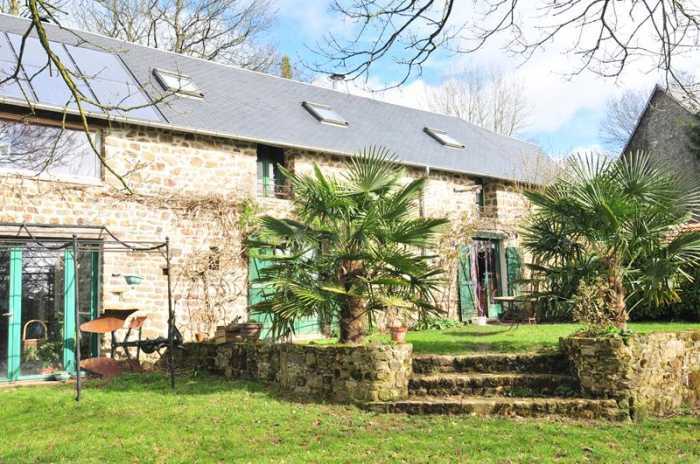 This delightful house and gîte are next door to each other in a quiet rural hamlet with separate gardens and superb views over the grounds, pond and stream. The gîte sleeps up to 10 people and has been successfully rented out by the present owner. The addition of a superb lounge extension to the main house which makes the most of the light and views makes this a super family home with income. Viewing is highly recommended. It is conveniently placed at the heart of the triangle Granville - Villedieu-les-Poêles - Avranches, ideal to discover the treasures of the Baie of Mont Saint-Michel. Local amenities are found at La Haye-Pesnel which is a 5 minute drive. It is 1 hour 10 minutes away from Caen Ouistreham Ferry port and 1 hour 20 minutes from Cherbourg. It is 12 km to the nearest beach at Genêts and 18 km to the UNESCO heritage site of Mont Saint Michel. The pretty market and tourist town of Villedieu-les-Poêles is 10 minutes away with mainline trains to Paris (approx. 2 hours 50 mins) and motorway access to the A84. It is 15 minutes away from the coast at Granville. Kitchen/Breakfast Room 5.29 x 4.71m Glazed double doors to south elevation. Exposed stone walls. Wood-burner. Tiled floor. Double ceramic sink unit with mixer tap. Space for free standing cooker. Space for free standing fridge/freezer. Original beams and features. Radiator. Utility Area with WC. Space and plumbing for washing machine. Urinal. Lounge 6.49 x 5.45m Exposed stone walls. Glazed double doors and side panels to south and 2 pairs of glazed double doors to terrace and west elevations. Tiled floor. 2 radiators. Wood-burner. Mezzanine 3.54 x 2.79m Picture window to south elevation. Exposed stone. Wood flooring. Stairs to open loft/storage area/6th bedroom. Bedroom 1 3.74 x 2.67m Window to west elevation. Radiator. Wood flooring. Bedroom 2 3.77 x 2.55m Picture window to south and window to west elevations. Wood flooring. Radiator. Shower Room Velux window to rear elevation. Shower cubicle with jets. WC. Hand basin. Exposed stone walls. Bedroom 3 3.73 x 3.45m Window and Velux window to front elevation. Wood flooring. Radiator. Opening to dressing room (there is plumbing provision to create an en-suite in this room) Exposed stone. Landing (via stairs from Dining Room) - Wood flooring. Velux window to front. Built-in cupboard. Wood-burner. Bedroom 4 4.50 x 2.61m Window and Velux window to south elevation. Wood flooring. Radiator. Shower Room Velux window to rear elevation. Shower. Hand basin. Wood flooring. Radiator. "Dry" toilet (could be converted into traditional WC). Bedroom 5 4.98 x 2.50m Window to east elevation. Wood flooring. Sloping ceiling. Radiator. Shower. Hand basin. Attached Garage 5.22 x 3.71m Reserves for hot water and hot water for radiators. Control for photovoltaic solar panels. Electrics. Double wooden doors to east elevation. The garden is laid to lawn with river frontage and large pond. 3,000l rainwater recuperation system for watering the garden with pump for use. Timber decking area (needs replacing) overlooking lake and stream. Timber Chalet. Greenhouse. Timber stable and chicken run. Double Garage 6.46 x 6.00m used for sheep under terrace. Paddock fenced with grillage. Second farm gate access to field. Timber Garden Store/Wood Shed. Open Plan Living Room/Dining Room/Kitchen 6.18 x 5.51m Door to rear and window and glazed double doors to terrace and south elevations. Exposed stone walls. Granite4 fireplace with wood-burner. Tiled floor. 2 radiators. Stairs to first floor with cupboard under. Hot water cylinder. Electrics. Space and plumbing for washing machine. Kitchen area single sin k unit. Shelves. Electric oven and grill. 4 ring gas hob. Space and plumbing for dishwasher. Space for upright fridge/freezer. Landing Laminate flooring. Recess with clothes hanging rail. Stairs to second floor. Bedroom 1 3.64 x 2.80m Laminate flooring. Window to south elevation. Radiator. Exposed beams. Bedroom 2 3.89 x 2.61m Laminate flooring. Window to rear elevation. Radiator. Exposed beams. Shower Room 2.19 x 1.99m Window to south elevation. WC. Shower cubicle. Hand basin. Exposed stone wall. Vent. Radiator. Laminate flooring. Exposed beams. Landing Velux window to front elevation. Laminate flooring. En-Suite Bathroom Corner bath with mixer tap/shower fitment and tiled surround. Vanity unit. Laminate flooring. Attached corrugated iron garage 4.04 x 4.00m. Sliding wooden door to north elevation. Oil storage tank and boiler. Tap. Enclosed garden. Terrace decking area. Mains water and electricity ( one meter for water but separate meters for electricity). Drainage to an all water septic tank serving both properties. Oil fired central heating in the gîte. Geothermal heating in the main house. Broadband internet connection. Please note : Whilst the Energy Report has been carried out there is no energy rating because the Vendor does not have the last 3 years' energy bills for full time occupation.